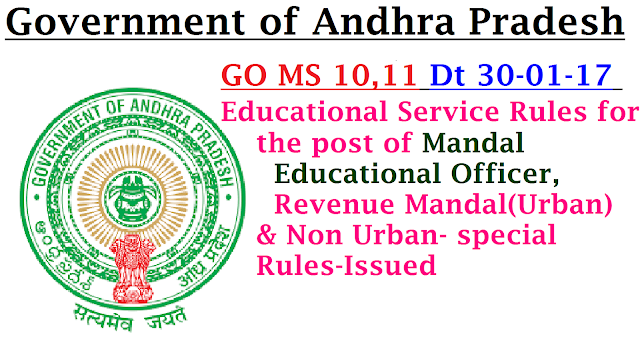 GOVERNMENT OF ANDHRA PRADESH- G.O.MS.No.10,11 School Education – Andhra Pradesh Educational Service Rules for the post of Mandal Educational Officer, Revenue Mandal - Special Rules– Andhra Pradesh Educational Service Rules for the post of Mandal Educational Officer, Revenue Mandal (Urban) – Special Rules– Issued. School Education – Andhra Pradesh Educational Service Rules for the post of Mandal Educational Officer, Revenue Mandal - Special Rules– Issued. G.O.MS.No. 10 , Dated: .01.2017.
years of age as on 1st May of the year. School Education – Andhra Pradesh Educational Service Rules for the post of Mandal Educational Officer, Revenue Mandal (Urban) – Special Rules– Issued.